Hockey Fights Cancer™, a joint initiative founded by the NHL and NHLPA, begins with programming and Club participation October 24 and runs until November 18. 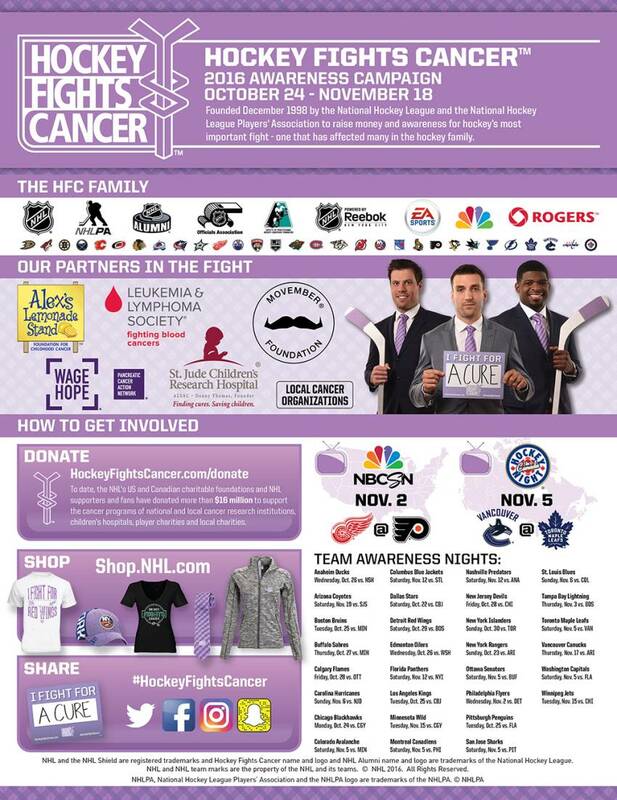 NEW YORK/TORONTO (Oct. 24, 2016) – Hockey Fights Cancer™, a joint initiative founded by the National Hockey League (NHL®) and National Hockey League Players’ Association (NHLPA), begins today with programming and Club participation from October 24 to November 18. The initiative is a program of the NHL’s U.S. and Canadian charitable foundations which, along with NHL supporters and fans, have donated more than $16 million to support national and local organizations involved in cancer care and research. Lavender, the official color of Hockey Fights Cancer™ representing all cancers, will be featured prominently throughout the campaign. •	Alex’s Lemonade Stand Foundation, a new partner this season, will use its donation to support three critical areas for families with children who have cancer: supporting grants distributed via the Young Investigators Award to promising early career scientists; the Travel for Care Program assisting families who face the need to travel for treatment; and the SuperSibs program which provides brothers and sisters of childhood cancer with resources and activities to help them cope during turbulent times. •	The Leukemia & Lymphoma Society, returning for the seventh season, will continue to use its donation to invest in research to advance therapies and save lives, including targeted therapies and immunotherapies. •	The Movember Foundation, returning for the fourth season, continues to use its donation to fund its men’s health initiatives, specifically in the areas of prostate cancer, and testicular cancer. •	Pancreatic Cancer Action Network, returning for the seventh season, will allocate its donation to its Community for Progress professional development and mentorship program for its scientific researchers, which fosters collaborations and is designed to strengthen the pancreatic cancer research community. •	St. Jude Children's Research Hospital®, also a new partner this season, will use its donation to further its lifesaving mission: Finding cures. Saving children.® St. Jude is leading the way the world understands, treats and defeats childhood cancer and other life-threatening diseases. All 30 NHL Member Clubs are supporting the initiative by designating one home game as the official Hockey Fights Cancer™ in-arena awareness night, featuring unique programming and partnerships with local cancer organizations. The NHL and NHLPA are also supporting local cancer organizations in all 30 NHL markets, and $250,000 will be distributed by the NHL’s U.S. and Canadian charitable foundations locally and nationally in conjunction with this year’s initiative. •	Play EA SPORTS NHL® 17 during the month of November where the Movember campaign will be integrated into Hockey Ultimate Team, a mode that lets fans build and play as their dream team of favorite players. 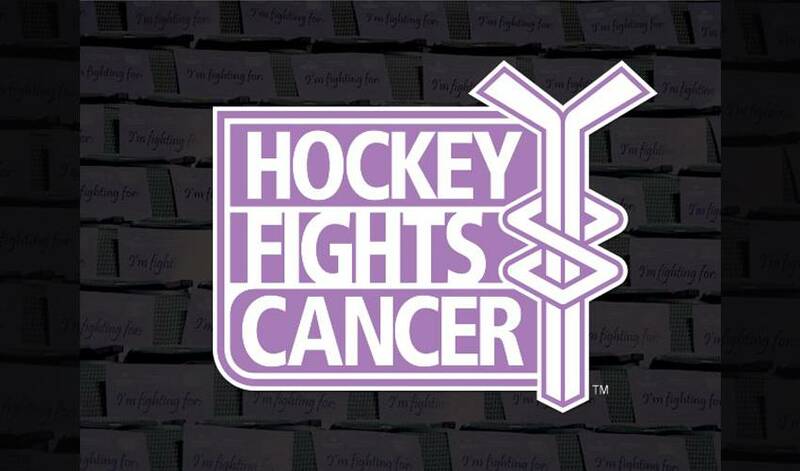 EA SPORTS is also donating $10,000 to Hockey Fights Cancer.